The history of Scotland begins around 10,000 years ago, when humans first began to inhabit Scotland after the end of the Devensian glaciation, the last ice age. Of the Stone Age, Bronze Age, and Iron Age civilization that existed in the country, many artifacts remain, but few written records were left behind. The written history of Scotland largely begins with the arrival of the Roman Empire in Britain, when the Romans occupied what is now England and Wales, administering it as a Roman province called Britannia. To the north was territory not governed by the Romans — Caledonia, by name. Its people were the Picts. From a classical historical viewpoint Scotland seemed a peripheral country, slow to gain advances filtering out from the Mediterranean fount of civilisation, but as knowledge of the past increases it has become apparent that some developments were earlier and more advanced than previously thought, and that the seaways were very important to Scottish history. Because of the geographical orientation of Scotland and its strong reliance on trade routes by sea, the nation held close links in the south and east with the Baltic countries, and through Ireland with France and the continent of Europe. Following the Acts of Union and the subsequent Scottish Enlightenment and Industrial Revolution, Scotland became one of the commercial, intellectual and industrial powerhouses of Europe. Its industrial decline following the Second World War was particularly acute, but in recent decades the country has enjoyed something of a cultural and economic renaissance, fuelled in part by a resurgent financial services sector, the proceeds of North Sea oil and gas, and latterly a devolved parliament. Stirling Castle has stood for centuries atop a volcanic crag defending the lowest ford of the River Forth. The fortification underwent numerous sieges. People lived in Scotland for at least 8,500 years before recorded history dealt with Britain. At times during the last interglacial period (130,000 – 70,000 BCE) Europe had a climate warmer than today's, and early humans may have made their way to Scotland, though archaeologists have found no traces of this. Glaciers then scoured their way across most of Britain, and only after the ice retreated did Scotland again become habitable, around 9600 BCE. Mesolithic hunter-gatherer encampments formed the first known settlements, and archaeologists have dated an example at Cramond near Edinburgh to around 8500 BC. Numerous other sites found around Scotland build up a picture of highly mobile boat-using people making tools from bone, stone and antlers. Neolithic farming brought permanent settlements, and the wonderfully well-preserved stone house at Knap of Howar on Papa Westray dating from 3500 BC predates by about 500 years the village of similar houses at Skara Brae on West Mainland, Orkney. The settlers introduced chambered cairn tombs from around 3500 BC (Maeshowe offers a prime example), and from about 3000 BC the many standing stones and circles such as the Ring of Brodgar on Orkney and Callanish on Lewis. These form part of the Europe-wide Megalithic culture which also produced Stonehenge in Wiltshire, and which pre-historians now interpret as showing sophisticated use of astronomical observations. The cairns and Megalithic monuments continued into the Bronze age, and hill forts started to appear, such as Eildon Hill near Melrose in the Scottish Borders, which goes back to around 1000 BC and which accommodated several hundred houses on a fortified hilltop. Brythonic Celtic culture and language spread into Scotland at some time after the 8th century BC, possibly through cultural contact rather than through mass invasion, and systems of kingdoms developed. From around 700 BC the Iron age brought numerous hill forts, brochs and fortified settlements which support the image of quarrelsome tribes and petty kingdoms later recorded by the Romans, though evidence that at times occupants neglected the defences might suggest that symbolic power had as much significance as warfare. The only surviving pre-Roman account of Scotland originated with the Greek Pytheas of Massalia who circumnavigated the British islands (which he called Pretaniké) in 325 BC, but the record of his visit dates from much later. The Roman invasion of Britain began in earnest in AD 43. Following a series of military successes in the south, forces led by Gnaeus Julius Agricola entered Scotland in 79. The Romans met with fierce resistance from the local population of Caledonians. In 82 or 83 Agricola sent a fleet of galleys up round the coast of Scotland, as far as the Orkney Islands. In 84 Agricola defeated the Caledonian tribes at the Battle of Mons Graupius due to superior tactics and the use of professional troops. The only historical source for this comes from the writings of Agricola's son-in-law, Tacitus. Archaeology backed up with accurate dating from dendrochronology suggests that the occupation of southern Scotland started before the arrival of Agricola. Whatever the exact dating, for the next 300 years Rome had some presence along the southern border. Although the Romans had failed to conquer Caledonia they attempted to maintain control through military outposts and built a few roads. They were eventually forced or chose to withdraw, concluding that the wealth of the land did not justify the extensive garrisoning requirements. the Picts, the original peoples (possibly a Brythonic Celtic group) who occupied most of Scotland north of the Firth of Clyde and the Firth of Forth: the area known as "Pictavia"
the Old Irish-speaking Scotti (Scots) or more specifically, the Dál Riatans, arrived from Ireland from the late 5th century onwards, taking possession of the Western Isles and the west coast in the Kingdom of Dál Riata. the Anglo-Saxons expanding from Bernicia and the continent. Notably seizing Gododdin in the 7th Century. It was their language which eventually became the predominant tongue of lowland Scotland, a variant of English which was initially termed Inglis, whereas the name "Scottis" (pronounced the same way as Scots) referred to the Gaelic language spoken largely in the Highlands. However, during the late Middle Ages the name "Scots" was transferred to the Scottish form of English, while the Celtic language of the Highlands came to be known only as Gaelic. In the aftermath of the 795 Viking raid on Iona, the Norse Jarls of Orkney took hold of the Western Isles, Caithness and Sutherland, while Norse settlers mixed with the inhabitants of Galloway to become the Gallgaels. The British Saint Ninian conducted the first Christian mission in Scotland. From his base, the Candida Casa (present-day Whithorn) on the Solway Firth, he spread the faith in the south and east of Scotland and in the north of England. However, according to the writings of Saint Patrick and Saint Columba, the Picts appear to have renounced Christianity in the century between Ninian's death (432) and the arrival of Saint Columba in 563. The reason is not known. The Gaels re-introduced Christianity into Pictish Scotland, gradually pushing out worship of the older Celtic gods. The most famous evangelist of that period, Saint Columba, came to Scotland in 563 and settled on the island of Iona having obtained permission from the Pictish king at his court in Inverness to settle on Iona and to spread Christianity. Some consider his (possibly apocryphal) conversion of the Pictish king Bridei a key event in the Christianisation of Scotland. The myth of MacAlpin's Treason tells how Alba was born when the Gael Cináed mac Ailpín conquered the Picts, however Alba is a creation of Constantine II. Cináed's son Constantine had the Series Longoir written to show his family's claim to the throne of a united Pictland. The triumph of Gaelic over Pictish and the change from Pictland to Alba is placed in the half-century reign of Constantine II. Why and how this happened is unknown. At first this new kingdom corresponded to Scotland north of the Rivers Forth and Clyde. South west Scotland remained under the control of the Strathclyde Britons. South-east Scotland was under the control from around 638 of the proto-English kingdom of Bernicia, then of the Kingdom of Northumbria. This portion of Scotland was contested from the time of Constantine II and finally fell into Scottish hands in 1018, when Máel Coluim II pushed the border as far south as the River Tweed. This remains the south-eastern border to this day. Scotland, in the geographical sense it has retained for nearly a millennium, completed its expansion by the gradual incorporation of the Britons' kingdom of Strathclyde into Alba. In 1034, Donnchad I inherited Alba from his maternal grandfather, Máel Coluim II. With the exception of Orkney, the Western Isles, Caithness and Sutherland, which remained under Norse rule, Scotland had assumed the shape it was to retain thereafter. Macbeth, the Cenél Loairn candidate for the throne whose family had been suppressed by Máel Coluim II, defeated Donnchad in battle in 1040. Macbeth then ruled well for seventeen years before Donnchad's son Máel Coluim III overthrew him. (William Shakespeare, in his play Macbeth, later immortalised these events, in a heavily fictionalised way based on inaccurate contemporary history that flattered the antecedents of James VI of Scotland/I of England at Macbeth's expense). After the Norman Conquest in 1066, Edgar, one of the claimants of the English throne opposing William the Conqueror, fled to Scotland. Máel Coluim married Edgar's sister Margaret, and thus came into opposition to William who had already disputed Scotland's southern borders. William invaded Scotland in 1072, riding through Lothian and past Stirling on to the Firth of Tay where he met his fleet of ships. Máel Coluim submitted, paid homage to William, and surrendered his son Donnchad as a hostage. Margaret herself had a great influence on Scotland. She is said to have brought European cultivation to the warlike Scottish court. She had an English father and a Hungarian mother and had grown up in Hungary, recently pagan and largely untouched by the European culture of the period. However at this point the Church explicitly recognised the Bishop of Rome (the Pope) as its head and at her instigation, the Benedictine order founded a monastery at Dunfermline, and St Andrews began to replace Iona as the centre of ecclesiastical leadership. The rites of the Scottish church became gradually re-integrated with mainstream Western Catholicism from that base. When Malcolm died in 1093, his brother Domnall III succeeded him. However, William II of England backed Malcolm's son by his first marriage, Duncan, as a pretender to the throne. With the English behind him Duncan briefly seized power. His murder within a few months saw Domnall restored with Edmund as his heir. The two ruled Scotland until two of Edmund's younger brothers returned from exile in England with English military backing. Victorious, the younger brothers imprisoned Domnall and Edmund for life, and Edgar, the oldest of the three, became king in 1097. Shortly afterwards Edgar and the King of Norway, Magnus Bare Legs concluded a treaty recognizing Norwegian authority over the Western Isles. In practice Norse control of the Isles was of the loosest nature, with local chiefs enjoying a high degree of independence. The following century, Somerled, the greatest of these, became King of the Hebrides in his own right. His descendants, the Lords of the Isles, continued to enjoy a semi-independent status until the end of the fifteenth century. When Edgar died in 1107, Margaret's third son Alexander became king, and when he in turn died in 1124, the crown passed to her fourth son David I. During David's reign Lowland Scots (known as Inglis then) began to grow in south east Scotland, although Gaelic would continue to be spoken in many parts of what would become the Lowlands for centuries more. The governmental and cultural innovations introduced by the Norman conquerors of England impressed David greatly, and he arranged for several notables to come north and take up places within the Scottish aristocracy. The Normans came into frequent conflict with the native nobility, especially in the north east and south west of the country. In a mirror of the invitation of the Normans northwards, David received lands south of the border in fee from the English kings. This meant that the Kings of Scotland also functioned as Earls of Huntingdon, and that the Earls paid ceremonial homage to the English kings for the lands received. This homage proved problematic, however, as Malcolm Canmore as the King of Scotland had paid homage to the new Norman Kings of England twice after defeats during his various campaigns against the Normans in support of his Anglo-Saxon brother-in-law Edgar Atheling's claim to the English throne. In 1263 Scotland and Norway fought the Battle of Largs for control over the Western Isles. Although the battle was little more than a series of indecisive skirmishes, it did at least prove that the distant kings of Norway could not continue to control the Isles. This was recognized soon after when the Norwegian king Magnus VI of Norway signed the Treaty of Perth in 1266, acknowledging Scottish suzerainty over the islands. Bit by bit, the Island chiefs were politically integrated into the Scottish state. In 1284 all of the descendants of Somerled attended a parliament called by Alexander III to acknowledge his granddaughter, Margaret, as heir to the throne. The subsequent dynastic crisis caused by the death of Margaret and the onset on the Wars of Independence reversed this process. By the middle of the fourteenth century the MacDonald Lords of the Isles were once again loosening their ties to the crown. A series of deaths in the line of succession in the 1280s, followed by King Alexander III's death in 1286 left the Scottish crown in disarray. His granddaughter Margaret, the "Maid of Norway", a four-year old girl, was the heir. Edward I of England, as Margaret's great-uncle, suggested that his son (also a child) and Margaret should marry, stabilising the Scottish line of succession. In 1290 Margaret's guardians agreed to this, but Margaret herself died in Orkney on her voyage from Norway to Scotland before either her coronation or her marriage could take place. John Balliol, the man with the strongest claim to the throne, became king (30 November 1292). Robert Bruce of Annandale, the next strongest claimant, accepted this outcome with reluctance (his grandson and namesake later ascended the throne as Robert I). Over the next few years Edward I used the concessions he had gained during the Great Cause systematically to undermine both the authority of King John and the liberty of Scotland. In 1295 John, on the urgings of his chief councillors, entered into an alliance with France. This was the beginning of the Auld Alliance. In 1296 Edward invaded Scotland, deposing King John. The following year William Wallace and Andrew de Moray raised southern and northern parts of the country to resist the occupation. Under their joint leadership an English army was defeated at the Battle of Stirling Bridge. For a short time Wallace ruled Scotland in the name of John Balliol as Guardian of the realm. Edward came north in person and defeated Wallace at the Battle of Falkirk (1298). Wallace escaped but resigned as Guardian of Scotland. John Comyn and Robert the Bruce were appointed in his place. In 1305 Wallace fell into the hands of the English, who executed him for treason despite the fact that he owed no allegiance to England. In February 1306 Robert Bruce, the grandson of the Claimant, participated in the murder of John Comyn, a leading rival. Bruce went on to seize the crown, but Edward's forces overran the country after defeating Bruce's small army at the Battle of Methven. Despite the excommunication of Bruce and his followers by Pope Clement V his support slowly strengthened; and by 1314 with the help of leading nobles such as Sir James Douglas and the Earl of Moray only the castles at Bothwell and Stirling remained under English control. Edward I had died in 1307. His heir Edward II moved an army north to break the siege of Stirling Castle and reassert control. Robert defeated that army at the Battle of Bannockburn in 1314, securing de facto independence. In 1320 a remonstrance to the Pope from the nobles of Scotland (the Declaration of Arbroath) went part of the way towards convincing Pope John XXII to overturn the earlier excommunication and nullify the various acts of submission by Scottish kings to English ones so that Scotland's sovereignty could be recognised by the major European dynasties. In 1326, the first full Parliament of Scotland met. The parliament had evolved from an earlier council of nobility and clergy, the colloquium, constituted around 1235, but in 1326 representatives of the burghs — the burgh commissioners — joined them to form the Three Estates. In 1328, Edward III signed the Treaty of Northampton acknowledging Scottish independence under the rule of Robert the Bruce. Four years after Robert's death in 1329, however, England once more invaded on the pretext of restoring the "Rightful King" — Edward Balliol, son of John Balliol — to the Scottish throne, thus starting the Second War of Independence. In the face of tough Scottish resistance, led by Sir Andrew Murray, the son of Wallace's comrade in arms, successive attempts to secure Balliol on the throne failed. Edward III lost interest in the fate of his protege after the outbreak of the Hundred Years' War with France. In 1341 David II, King Robert's son and heir, was able to return from temporary exile in France. Balliol finally resigned his vacant claim to the throne to Edward in 1356, before retiring to Yorkshire, where he died in 1364. After David's death, Robert II, the first of the Stewart (later Stuart) kings, came to the throne in 1371. He was followed in 1390 by his ailing son John, who took the regnal name Robert III, to avoid awkward questions over the exact status of the first King John. During Robert III's reign (1390–1406), actual power rested largely in the hands of his brother, also named Robert, the Duke of Albany. In 1396 during this king's reign, the last trial by combat in Europe, the Battle of the Clans took place before the King in Perth. However, problems with England continued. After the suspicious death (possibly on the orders of the Duke of Albany) of his elder son, David, Duke of Rothesay in 1402, Robert, fearful for the safety of his younger son, James (the future James I), sent him to France in 1406. Unfortunately, the English captured him en route and he spent the next 18 years as a prisoner held for ransom. As a result, after the death of Robert III, regents ruled Scotland: first, the Duke of Albany; and later his son, during whose office the country fell into near anarchy. When Scotland finally paid the ransom in 1424, James returned at the age of 32, with his English bride. He determined to restore justice and the rule of law and to deal with his enemies. He set about this immediately and ruthlessly, using military measures, reforming the parliamentary and court systems, and killing anyone who threatened his authority, including his cousin Albany. This resulted in a much greater amount of power in the hands of the Scottish government than at any time preceding, but the process led to great unpopularity for James and finally to his assassination in 1437. His son James II (reigned 1437–1460), when he came of age in 1449, continued his father's policy of weakening the great noble families, most notably taking on the great House of Douglas that had come to prominence at the time of the Bruce. In 1468 the last great acquisition of Scottish territory occurred when James III married Margaret of Denmark, receiving the Orkney Islands and the Shetland Islands in payment of her dowry. After the death of James III in 1488, during or after the Battle of Sauchieburn, his successor James IV successfully ended the quasi-independent rule of the Lord of the Isles, bringing the Western Isles under effective Royal control for the first time. In 1503, he married Henry VII's daughter, Margaret Tudor, thus laying the foundation for the 17th century Union of the Crowns. James IV's reign is often considered to be a period of cultural flourishing, and it was around this period that the European Renaissance began to infiltrate Scotland. James IV was the last known Scottish king known to speak Gaelic, although some suggest his son could also. In 1512, under a treaty extending the Auld Alliance, all nationals of Scotland and France also became nationals of each other's countries, a status not repealed in France until 1903 and which may never have been repealed in Scotland. However a year later, the Auld Alliance had more disastrous effects when James IV was required to launch an invasion of England to support the French when they were attacked by the English under Henry VIII. The invasion was stopped decisively at the battle of Flodden Field during which the King, many of his nobles, and over 10,000 troops — The Flowers of the Forest — were killed. The extent of the disaster impacted throughout Scotland because of the large numbers killed, and once again Scotland's government lay in the hands of regents. The song The Flooers o' the Forest commemorated this, an echo of the poem Y Gododdin on a similar tragedy in about 600. When James V finally managed to escape from the custody of the regents with the aid of his redoubtable mother in 1528, he once again set about subduing the rebellious Highlands, Western and Northern isles, as his father had had to do. He married the French noblewoman Marie de Guise. His reign was fairly successful, until another disastrous campaign against England led to defeat at the battle of Solway Moss (1542). James died a short time later. The day before his death, he was brought news of the birth of an heir: a daughter, who became Mary I of Scotland (or 'Mary, Queen of Scots'). James is supposed to have remarked in Scots that "it cam wi a lass, it will gang wi a lass" - referring to the House of Stewart which began with Walter Stewart's marriage to the daughter of Robert the Bruce. Once again, Scotland was in the hands of a regent, James Hamilton, Earl of Arran. Within two years, the Rough Wooing, Henry VIII's military attempt to force a marriage between Mary and his son, Edward, had begun. This took the form of border skirmishing. To avoid the "rough wooing", Mary was sent to France at the age of five, as the intended bride of the heir to the French throne. Her mother stayed in Scotland to look after the interests of Mary — and of France — although the Earl of Arran acted officially as regent. In 1547, after the death of Henry VIII, forces under the English regent Edward Seymour, 1st Duke of Somerset were victorious at the Battle of Pinkie Cleugh, the climax of the Rough Wooing and followed up by occupying Edinburgh. However it was to no avail since \of Scotland in a hostile environment. She did not do well and after only seven turbulent years, at the end of which Protestants had gained complete control of Scotland, she had perforce to abdicate. Imprisoned for a time in Loch Leven Castle, she eventually escaped and attempted to regain the throne by force. After her defeat at the Battle of Langside in 1568 she took refuge in England, leaving her young son, James VI, in the hands of regents. In England she became a focal point for Catholic conspirators and was eventually executed on the orders of her kinswoman Elizabeth I. During the 16th century, Scotland underwent a Protestant Reformation. In the earlier part of the century, the teachings of first Martin Luther and then John Calvin began to influence Scotland. the execution of a number of Protestant preachers, most notably the Lutheran influenced Patrick Hamilton in 1528 and later the proto-Calvinist George Wishart in 1546 who was burnt at the stake in St. Andrews by Cardinal Beaton for heresy, did nothing to stem the growth of these ideas. Beaton was assassinated shortly after the execution of George Wishart. The eventual Reformation of the Scottish Church followed a brief civil war in 1559-60, in which English intervention on the Protestant side was decisive. A Reformed confession of faith was adopted by Parliament in 1560, while the young Mary Queen of Scots was still in France. The most influential figure was John Knox, who had been a disciple of both John Calvin and George Wishart. Roman Catholicism was not totally eliminated, and remained strong particularly in parts of the highlands. The Reformation remained somewhat precarious through the reign of Queen Mary, who remained Roman Catholic but tolerated Protestantism. Following her deposition in 1567, her infant son James VI was raised as a Protestant. In 1603, following the death of the childless Queen Elizabeth I, the crown of England passed to James. He took the tle James I of England and James VI of Scotland, thus unifying these two countries under his personal rule. For a time, this remained the only political connection between two independent nations, but it foreshadowed the eventual 1707 union of Scotland and England under the banner of the Great Britain. Although Scotland and England had both rejected papal authority, the Reformation in each country proceeded in slightly different directions. England retained much of the old Catholic practice, including a formal liturgy and order of service, whereas the Scots embraced more of a free-form Calvinism. Although James had tried to get the Scottish Church to accept some of the High Church Anglicanism of his southern kingdom, he met with limited success. His son and successor, Charles I, took matters further, introducing an English-style Prayer Book into the Scottish church in 1637. This resulted in anger and widespread rioting. (The story goes that it was initiated by a certain Jenny Geddes who threw a stool in St Giles Cathedral). Representatives of various sections of Scottish society drew up the National Covenant in 1638, objecting to the King's liturgical innovations. In November of the same year matters were taken even further, when at a meeting of the General Assembly in Glasgow the Scottish bishops were formally expelled from the Church, which was then established on a full Presbyterian basis. Charles gathered a military force; but as neither side wished to push the matter to a full military conflict, a temporary settlement was concluded at Berwick. Matters remained unresolved until 1640 when, in a renewal of hostilities, Charles's northern forces were defeated by the Scots at Newburn to the west of Newcastle. During the course of these "Bishops' Wars" Charles tried to raise an army of Irish Catholics, but was forced to back down after a storm of protest in Scotland and England. The backlash from this venture provoked a rebellion in Ireland and Charles was forced to appeal to the English Parliament for funds. Parliament's demands for reform in England eventually resulted in the English Civil War. This series of civil wars that engulfed England in the 1640s and 50s is known to modern historians as the Wars of the Three Kingdoms. The Covenanters meanwhile, were left governing Scotland, where they raised a large army of their own and tried to impose their religious settlement on Episcopalians and Roman Catholics in the north of the country. However, not all Scots supported the Covenanter's taking arms against their King. In 1645, James Graham, 1st Marquess of Montrose attempted to raise the Highlands for the King. Few Scots would follow him, but, aided by 1,000 Irish, Highland and Islesmen troops sent by the Irish Confederates under Alasdair MacColla, and an instinctive genius for mobile warfare, he was stunningly successful. A Scottish Civil War began in September 1644 with his victory at battle of Tippermuir. After a series of victories over poorly trained Covenanter militias, the lowlands were at his mercy. However, at this high point, his army was reduced in size, as MacColla and the Highlanders preferred to continue the war in the north against the Campbells. Shortly after, what was left of his force was defeated at the Battle of Philiphaugh. Escaping to the north, Montrose attempted to continue the struggle with fresh troops; but in July 1646 his army was disbanded after the King surrendered to the Scots army at Newark, and the civil war came to an end. The Covenanter government was outraged by Parliament's execution of Charles I in 1649, carried out in the face of their strongest objections. No sooner did news of his death reach the north than his son was proclaimed King Charles II in Edinburgh. 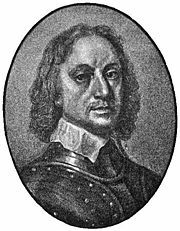 Oliver Cromwell invaded Scotland in 1650, and defeated the Scottish army in battles at Dunbar and Worcester. Scotland was then occupied by an English force under George Monck throughout the Interregnum and incorporated into the Puritan-governed Commonwealth. See article: Royalist rising of 1651 to 1654. From 1652 to 1660, Scotland was part of the Commonwealth and Protectorate, under English control but gaining equal trading rights. Upon its collapse, and with the restoration of Charles II, Scottish independence returned. Scotland regained its parliament, but the English Navigation Acts prevented the Scots engaging in what would have been lucrative trading with England's growing colonies. The formal frontier between the two countries was re-established, with customs duties which, while they protected Scottish cloth industries from cheap English imports, also denied access to English markets for Scottish cattle or Scottish linens. (Braudel 1984 p 370). After the Restoration, Charles' Scottish affairs were managed by senior noblemen, the most prominent of whom was John Maitland, Duke of Lauderdale, his Secretary of State and High Commissioner to the Scottish Parliament. Near the outset of the reign Episcopacy was reintroduced. This was to be a source of particular trouble in the south-west of the country, an area particularly strong in its Presbyterian sympathies. Abandoning the official church, many of the people here began to attend illegal field assemblies, known as conventicles. Official attempts to suppress these led to a rising in 1679, defeated by James Duke of Monmouth, the King's illegitimate son, at the Battle of Bothwell Bridge. In the early 1680s a more intense phase of persecution began, in what was later to be called the "the Killing Time". When Charles died in 1685 and his brother, a Roman Catholic, succeeded him as James VII of Scotland (and II of England), matters came to a head. Beginning around 1605, Scottish clans began to undergo a forced migration to Ireland in order to clear land for the king's recreation. Mostly Protestant Scots were sent to the catholic Ireland to ensure that there would be too much internal strife for Ireland to focus on its neighbors. James's attempt to introduce religious toleration to England's Roman Catholics alienated his Protestant subjects. Neither this, nor his moves towards absolutism, provoked outright rebellion, as it was believed that he would be succeeded by his daughter Mary, a Protestant and the wife of William of Orange. When, in 1688, James produced a male heir, everything changed. At the invitation of seven Englishmen, William landed in England with 40,000 men, and James fled. Whilst this was primarily an English event, the "Glorious Revolution" had a great impact on Scottish history. Whilst William accepted limits on royal power, under the Bill of Rights (a contract between himself and the English parliament), Scotland had an equivalent document in the Claim of Rights. This is an important document in the evolution of the rule of law and the rights of subjects. Most Scots supported William of Orange, but many (particularly in the Highlands) remained sympathetic to James VII. His cause, which became known as Jacobitism, spawned a series of uprisings. An initial Jacobite rising under John Graham, 1st Viscount Dundee (Bonnie Dundee) defeated William's forces at the Battle of Killiecrankie in 1689, but Dundee was slain in the fighting, and the army was soon defeated at the Battle of Dunkeld. The complete defeat of James in Ireland by William at the Battle of Aughrim (1691), ended matters for a time. (Ironically, the Protestant William had also enjoyed the support of the Pope and the Catholic Habsburg monarchy against the aggressive foreign policy of Louis XIV of France). The late 17th century was economically difficult for Scotland. The bad harvests of the seven ill years in the 1690s led to severe famine and depopulation. English protectionism kept Scots traders out of the new colonies, and English foreign policy disrupted trade with France. Many Scots emigrated to Ulster (the Ulster-Scots). The Parliament of Scotland of 1695 enacted a number of remedies for the desperate economic situation, including setting up the Bank of Scotland. The Act for the Settling of Schools established a parish-based system of public education throughout Scotland. The Company of Scotland received a charter to raise capital through public subscription to trade with Africa and the Indies. In attempts to expand, the Scots established abortive colonies both in Nova Scotia and also at Stuart's Town in what is now South Carolina. Scottish settlers had also been sent to the English colony of New Jersey. The Company of Scotland soon became involved with the Darien scheme, an ambitious plan devised by William Paterson to establish a colony on the Isthmus of Panama in the hope of establishing trade with the Far East — the principle that led to the construction of the Panama Canal much later. The Company of Scotland easily raised subscriptions in London for the scheme. But the English government opposed the idea: involved in the War of the Grand Alliance from 1689 to 1697 against France, it did not want to offend Spain, which claimed the territory as part of New Granada. The English investors had perforce to withdraw. Returning to Edinburgh, the Company raised 400,000 pounds in a few weeks. Three small fleets with a total of 3000 men eventually set out for Panama in 1698. The exercise proved a disaster. Poorly equipped; beset by incessant rain; under attack by the Spanish from nearby Cartagena; and refused aid by the English in the West Indies, the colonists abandoned their project in 1700. Only 1000 survived and only one ship managed to return to Scotland. A desperate ship from the colony which called at Port Royal received no assistance—on the orders of the English government. Realising the dangers of the conflicting claims and aims of two independent kingdoms at odds with one another, William of Orange called for a union of the two countries. It did not happen. Union, when it did come in 1707, restored free trade between the countries and gave the Scots access to the burgeoning English Empire. By 1700, the Protestant monarchy seemed in danger of coming to an end with the childless Stuart Princess Anne. Rather than return to her Roman Catholic brother James Francis Edward Stuart, the English Parliament enacted that Sophia of Hanover and her descendants should succeed (Act of Settlement 1701). However, the Scottish counterpart, the Act of Security, prohibited a Roman Catholic successor, leaving open the possibility that the crowns would diverge. Rather than risk the possible return of James Francis Edward Stuart, then living in France, the English parliament pressed for full union of the two countries. In 1707, despite much opposition in Scotland, the Treaty of Union was concluded. The treaty, which became the Act of Union 1707, confirmed the Hanoverian succession. It abolished both the Parliaments of England and Scotland, and established the Parliament of Great Britain. Scotland was to have 45 seats in the House of Commons, and a representation in the House of Lords. The act also created a common citizenship, giving Scots free access to English markets. The Church of Scotland and Scottish law and courts remained separate. This union was highly controversial among Scots, and increasingly so as the hoped-for economic revival was not immediately forthcoming. When it did come, in the second half of the century, it was Lowland Scotland that received the benefits. Jacobitism, however, was not yet a spent force. Indeed it was revived by the unpopularity of the union. In 1708 James Francis Edward Stuart attempted an invasion with a French fleet, but the Royal Navy prevented any from landing. A more serious attempt occurred in 1715. This rising (known as The 'Fifteen) envisaged simultaneous uprisings in Wales, Devon and Scotland. However, government arrests forestalled the southern ventures. In Scotland, John Erskine, Earl of Mar, nicknamed Bobbin' John, raised the Jacobite clans but proved to be an indecisive leader and an incompetent soldier. Mar captured Perth, but let a smaller government force under the Duke of Argyll hold the Stirling plain. Part of Mar's army joined up with risings in northern England and southern Scotland, and the Jacobites fought their way into England before being defeated at the Battle of Preston, surrendering on 14 November 1715. The day before, Mar failed to defeat Argyll at the Battle of Sheriffmuir. At this point, James belatedly landed in Scotland, but was advised that the cause was hopeless. He fled back to France. An attempted Jacobite invasion with Spanish assistance in 1719 met with little support from the clans and ended at the Battle of Glen Shiel. In 1745 the Jacobite rising known as The 'Forty-Five began. Charles Edward Stuart, known to history as Bonnie Prince Charlie or the Young Pretender, son of the Old Pretender, landed on the island of Eriskay in the Outer Hebrides. Several clans unenthusiastically joined him. At the outset he was successful, taking Edinburgh and then defeating the only government army in Scotland at the Battle of Prestonpans. They marched into England and got as far as Derby. It became increasingly evident that England would not support a Roman Catholic Stuart monarch. The Jacobite leadership had a crisis of confidence and retreated to Scotland. The Duke of Cumberland crushed the "Forty-Five" and the hopes of the Jacobites at the Battle of Culloden on 16 April 1746. Charles hid in Scotland with the aid of Highlanders until September 1746, when he escaped back to France with the help of Flora MacDonald. France expelled him in accordance with the Treaty of Aix-la-Chapelle (1748). He died a broken man, and his cause died with him. After 1745, British authorities acted to destroy the Scottish clan system in parliamentary acts of extreme vengeance. All aspects of Highland culture including the language were forbidden on pain of death. Highlanders were forced into the British Army to serve in the wider British Empire. Clan Chiefs were encouraged to consider themselves as owners of the land in their control, in the Lowland manner - it was previously considered common to the clan. As these new landowners converted land to more profitable sheep pasture, many of the peoples were dispossessed, facing forcible eviction. In what became known as the "Highland Clearances", the population fell significantly. Large numbers of Highlanders relocated to the lowland cities, becoming the labour force for the emerging industrial revolution, many were banished to other parts of the British Empire, particularly Nova Scotia, the Eastern Townships of Quebec, and Upper Canada (later known as Ontario). At the same time, the Scottish Agricultural Revolution changed the face of the Scottish Lowlands and transformed the traditional system of subsistence farming into a stable and productive agricultural system. This also had effects on population and precipitated a migration of Lowlanders. Internationally, Scotland's fate was tied to that of the United Kingdom as a whole. Shortly after Culloden, Britain successfully fought the Seven Years' War (1756 – 1763), demonstrating its rising significance as a great power. As a partner in the new Britain, Scotland began to flourish in ways that she never had as an independent nation. As the memory of the Jacobite rebellion faded away, the 1770s and 80s saw the repeal of much of the draconian laws passed earlier. Most were repealed by 1792 as the Episcopalian and Roman Catholic clergy no longer refused to pray for the reigning monarch, although Unitarians were still affected. Economically, Glasgow and Edinburgh began to grow at a tremendous rate at the end of the 18th century. The Scottish Renaissance was one of philosophy and science. 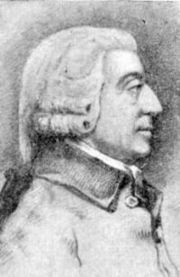 The Scottish Enlightenment involved names such as Adam Smith, David Hume and James Boswell. Scientific progress was led by James Hutton and William Thomson, 1st Baron Kelvin and James Watt (instrument maker to the University of Glasgow). Pre-eminent in contemporary literature were Robert Burns, an Ayrshire poet, and Sir Walter Scott, a prolific writer of ballads, poems and the historical novels. His romantic portrayals of Scottish life in centuries past still continue to have a disproportionate effect on the public perception of "authentic Scottish culture," and the pageantry he organised for the Visit of King George IV to Scotland made tartan and kilts into national symbols. George MacDonald also influenced views of Scotland in the latter parts of the 19th century. As the 19th century wore on, Lowland Scotland turned more and more towards heavy industry. Glasgow and the River Clyde became a major shipbuilding centre. Glasgow became one of the largest cities in the world, and known as "the Second City of Empire" after London. Tied as it was to the health of the British Empire, Scotland suffered after the First World War as it had gained beforehand. In the Highlands, which had provided a disproportionate number of recruits for the army, a whole generation of young men were lost, and many villages and communities suffered greatly. In the Lowlands, particularly Glasgow, poor working and living conditions led to industrial and political unrest. John MacLean became a key political figure in what became known as Red Clydeside, and in January 1919, the British Government, fearful of a revolutionary uprising, deployed tanks and soldiers in central Glasgow. During the 1920s and 1930s, due to global depression and foreign competition, Glasgow and Clydebank experienced high unemployment. In the Second World War naval bases and infrastructure in Scotland were primary German targets. Attacks on Scapa Flow and Rosyth gave RAF fighters their first successes downing bombers in Firth of Forth and East Lothian. The shipyards and heavy engineering factories in Glasgow and Clydeside played a key part in the war effort, and suffered attacks from the Luftwaffe. Clydebank endured great destruction and loss of life. The Highlands again provided a large number of troops for the war effort. Commandos and resistance fighters received training in the harsh conditions of the Lochaber mountains. As transatlantic voyages involved negotiating the north-west, Scotland played a key part in the battle of the North Atlantic. As in World War I, Scapa Flow in Orkney served as an important Royal Navy base. Shetland's relative proximity to occupied Norway, resulted in the Shetland Bus — fishing boats helping Norwegians flee the Nazis, and expeditions across the North Sea to assist resistance. Perhaps Scotland's most bizarre wartime episode occurred in 1941 when Rudolf Hess flew to Renfrewshire, possibly intending to broker a peace deal through the Duke of Hamilton. As the Cold War intensified, the United States deployed Polaris ballistic missiles, and submarines, in the Firth of Clyde's Holy Loch (1961). This was despite opposition from CND campaigners. A Royal Navy nuclear submarine base followed for Resolution class Polaris submarines at the expanded Faslane Naval Base on the Gare Loch. The first patrol of a Trident-armed submarine occurred in 1994, although the US base was closed at the end of the Cold War. On 11 September 1997, the Blair Labour government again held a referendum on the issue of devolution. A positive outcome led to the establishment of a devolved Scottish Parliament in 1999. The Scottish Parliament Building is adjacent to Holyrood House in Edinburgh. The feudal system lingered on in Scots law on land ownership, so that a landowner still had obligations to a feudal superior including payment of feu duty. In 1974 legislation began a process of redeeming feu duties so that most of these payments were ended, but it was only with the attention of the Scottish Parliament that a series of acts were passed, the first in 2000, for The Abolition of Feudal Tenure on November 28, 2004. This page was last modified 18:15, 22 January 2008. This article is licensed under the GNU Free Documentation License, which means that you can copy and modify it as long as the entire work (including additions) remains under this license. More information on this is available by clicking here.